Conforms to BS6471 QAP 50. Complete floor, wall and hard surface bactericidal cleaner. Ideal sanitising rinse for hospital blankets. Pleasantly perfumed. 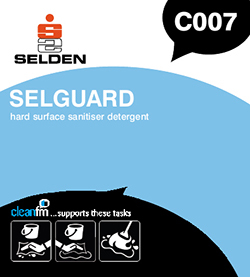 To clean, sanitise and deodorise walls, floors, working surfaces, carpets, upholstery and bed linen in hospitals, old people's homes, doctor’s surgeries, dentists and vets, kitchens, canteens and restaurants, washrooms, public places, swimming pools and sports clubs, supermarkets, shops, public transport and anywhere where clean, sanitary conditions are required. Composition An advanced blend of cationic and non-ionic surface active and water softening agents. Stability 2 Years stored in unopened containers in ambient temperatures.